oh, hello friend: you are loved. : discussion / what's your story? discussion / what's your story? While I was on the plane on the way back from my trip, I was reflecting on my blog and how it all got started. Then I had a thought about how all of you bloggers out there and how each one of us has our own story on how our blogs were started. Ok, I'll start with my story! Summer of 2007, I was close to graduating from college and my friends, Curtis and Mayra started a blog on blogger. I wish I remembered the exact moment and conversation but I think we were in a computer lab and I pretty much ended up starting a blog because they told me to. That blog was called 'hello loveli' and it's actually still online - you can see it here if you're curious.. but no judgements, the posts are so random and the way I wrote was pretty silly ;) I actually love that it's still up, floating around in cyberspace. I didn't have many entries. But those were the days when posts were so innocent and new.. and I had only 2 readers - Curtis and Mye. I posted about design and random life-things. I think I may have thought I was cool because I didn't use capital letters at the beginning of my sentences, lol. No real direction or blog-standard to meet, I just blogged true and genuine stuff about my life and interests. I hadn't visited that blog while until I wrote this post. I went back through each entry and laughed about the way I wrote. Watched the videos I posted and thought about why I posted those at the time. I look at my designs from back then and smile - I used a lot of fonts then. I guess I still kind of use a lot of fonts. I love fonts! There wasn't the pressure of putting out daily, consistent, original content, you know? Don't get me wrong. I love this blog. It is fun putting together new content for the blog and I'm fortunate to have met so many friends through oh, hello friend. I am honored when a reader comes to a craft show and says hi or someone sends me an email of encouragement. There's just something so innocent about those blog days so many years ago. When I posted things as if no one was reading, but just because I liked it. I posted for myself. Sometimes I feel like we may loose our blog identity along the way as we read + compare to all the other blogs out there. If that makes any sense at all :) Probably not. I think I may still be on jet lag. Going to sleep at 4am and waking up at 8am is not so good. I'm not sure why I strayed from that blog and started up oh, hello friend. I think because I wanted to start a shop and just created a new blog to go along with it. oh, hello friend came to be while sitting at my day job at Avery Dennison, super bored and wanting to start an etsy shop up. But that's a story for another day. I am definitely here thanks to 2 friends who told me to start a blog all those years ago. I'm so glad I listened to them! Ok. That's my blog story! 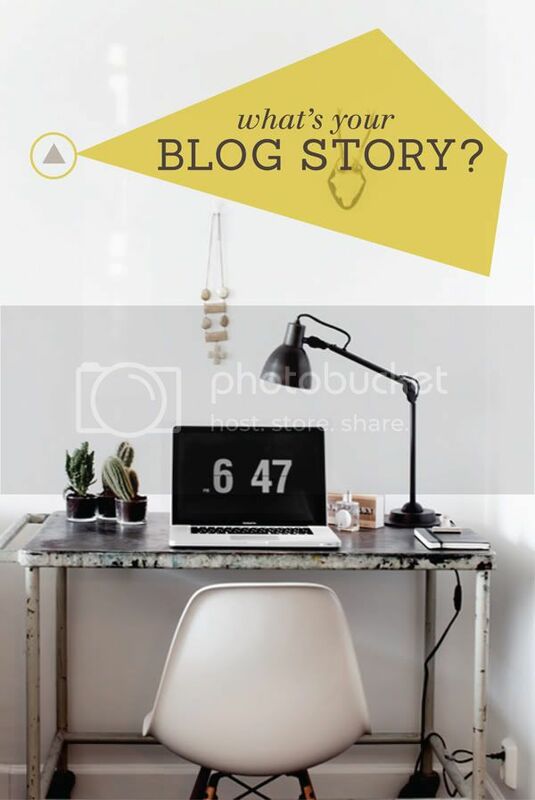 If you're a blogger - time to share your blog story! How did you get started with your blog? Did a friend tell you to start one? Maybe you were inspired to start one from seeing another blog? Can't wait to hear your story...be sure to leave links too! I've wanted to have a blog for a long time just for fun and to exercise my brain and to force myself to have some sort of "structure." My job is flexible, I don't really have a schedule or classes anymore, so I wanted to have something where I felt I needed to post regularly to keep myself "active," if that makes any sense. I like sharing things even if no one is reading, so I guess it's like a journal! I hope to connect with people and make new friends through blogging. I started as a "hyperlocal" blogger, sharing news, reviews and some opinions about the colourful (and slightly crazy) corner of London I lived in. My intention starting out was to engage with the immediate world around me but to also write something that actually may be read by someone other than me. That blog still exists at Bird in the Bush and still gets surprising numbers of views even though I left that part of London nearly a year ago. In October 2011 I began travelling long term with my partner and I started working as a freelance copywriter from wherever I found myself with my laptop and an internet connection. We are wonderfully homeless and refer to ourselves as "digital nomads". We have explored over fifteen countries in less than a year and we don't plan on stopping... As my journey took flight so did my travel blog As the Bird flies... and I now also work as a travel writer and work with travel brands to show off some of the best places and travel experiences in the world on my blog. I love how blogs have stories too and I look forward to reading more of these fascinating journeys on here! My blog—Oh, Hopscotch!—started because a boss told me to! She and I were bouncing links back and forth one day from a company that had this incredible blogger. We were both so inspired, and started throwing out aspirations to be like this person. Then she just said "Start one!". So I did! I had a blog already that I was just using strictly for personal photography, but I wanted one that was a little different and showcased other aspects of my personality and abilities. Not sure why I didn't just have that one change paces, maybe because I didn't like its title anymore? Anyhoo, it's fun to look back at those early posts from over two years ago, and see how I've changed and what my blogging has evolved into. I strive to keep it something personal to me, but to share useful things with others. Such a fine line to walk! Thanks for this opportunity to reminisce, and as always, thank you for sharing your world with us all! My blog was actually a spinoff of a column that I wrote for my college newspaper! I wanted to continue writing and to share some more recipes, random thoughts, healthy living tips, etc. Similar to you, I also have an old, rarely used blog floating around the web. Funny to look back on now! Before I started Laurendy Home 4 years ago I had been blogging sort of randomly on & off since 2001, first at Blog Drive then at Blogger - Sis & the City, Folk Laur, Just Sissy & Life of Laur were just a few of the many blogs I abondoned , never making it past 10 or 20 posts. . . I was all over the place with topics, no real theme. Laurendy Home also started on a whim. It was the day after I had put an offer in on a crazy house & my stomach was all butterflies, and I just needed to share my nail bitting with the world. Even if no one read it, it just calmed me to put it out there. I didn't get that house, so the blog started following my home search, then my closing nightmare, then all the plan I had for the home, all the work that had to be done, and so on. Somewhere along the line it became a decor design focused blog with bits of life, food & crafts thrown it. When I started it I didn't think it would last 20 post, I never dreamed I would still be blogging there 4 years & 1000+ posts later. I started blogging because I couldn't show all the great stuff I wanted to show/share in my work. I work as a journalist/photographer for magazines and I'm always looking for great products to buy and places to shop, sleep etc. So my blog worldly treasury is an online treasury that reveals hidden gems (from) all over the world. About interior, travel, lifestyle, beauty... All things I love. It's in Dutch & English. I started Greetings from Geralyn at http://greetingsfromgeralyn.blogspot.com because the store I worked as department manager for 9 years was going to close. I started a list....I want a computer....I want an etsy shop...I want a brick and mortar shop...I want a blog.....it is four years later. I achieved all of these goals and love it....especially my blog. so fun to read this danni!! i started my blog b/c i needed something creative to do after wedding planning haha!! i mainly started to document my journey in cooking, photography, and crafts... but now my blog is more about fashion and babies haha!! Oooh I love this post. Fun to hear your story, Danni! I've found it to be such a great community and a fun way to 'meet' people with similar interests, and it's a good way to keep busy, though sometimes I wish I were a teensy bit less busy! I loved reading your story. Maybe because I feel like it's sort of like yours, even though you're a way way WAY bigger blogger than I am. I started a few years ago because my sister told me so. I wrote about anything and nothing. My first posts (in 2010, I think) are terribly, horribly written but I keep them there to show how much I've changed as a writer. It wasn't until this past spring that I started writing from the heart and turned blogging into a love and less of a chore, or sorts. Even though I only have a dozen readers or so, I feel like blogging has truly become a part of me. Thanks for blogging + inspiring me as a little blogger! I started my first blog in order to connect with fellow crafters in Estonia and signed up for an Estonian craft site that offers a blogging platform. I fell in love with the blogging world, my reading list grew fast and I loved browsing the web and admired other bloggers. Then after a year I started Hapa's eco renewals (www.hapaeco.blogspot.com) on blogger, which was my blogging home up until a month ago. It was a way for me to document my sewing and other craft projects, but I was never very consistent with my blogging. After making 180 degree turn in my academic life (going from psychology to classical singing) I started taking my blog more seriously and following my passions more. So, this summer I started a new blog called Pearls & Scissors (pearlsandscissors.com) that combines all my crafting passions and is truly MY space. I love sharing my passion and hope that I inspire others to be creative in everything they do. I started my blog in 2009 but never kept up with it consistently. Then, this summer I suddenly had lots of free time and wanted to document all of the projects I had been working on. I love having a blog to motivate me to work my creativity and complete all my projects! Your story is too cute. Thank goodness for friends who push you into something! Danni these words are so true "when I posted things as if no one was reading, but just because I liked it". I think that's so genuine. So, pool convention, eh? Sounds... Pooly. My little blog story to keep you amused: little known fact, but I started a little fan site for Sailor Moon back in 1997. Fast forward to 2012 and after a lot of worrying about the uselessness of flooding the blogging world with yet another blog, I started Randomly Happy. Mostly my little blog is there to give myself a creative outlet and to meet new and interesting people. Funnily enough, it's brought me closer to family (my inlaws read everyday and worry when I don't post!) and friends who've started their own blogs. Hope you have good day and get lots of good stories. As long as I can remember, I've been obsessed with all things weddings - love, flowers, cake, all of it! I would read all the wedding blogs (Style Me Pretty, Wedding Chicks, Green Wedding Shoes) like everyday and thought you know, I'd love to write a blog about my passion. I started the blog before I was even engaged and now with my wedding about 3 months away it's turned into a great place where I can put all my wedding ideas and thoughts. Sure, I don't have a huge amount of readers but I love doing it. In school I really enjoyed writing and I love photography. I would love for this to eventually turn into something along the lines of a career but for now I'm just having a great time blogging and planning my wedding. Thanks for sharing your story and allowing us to share ours! Love the blog, super darling! The links at Foxes Earth were my grief work after one of our children died in an MV accident. I use blogs as journals, blogs as art form and historical record, blogs as solace and entertainment. Like you, I guess I started blogging online years ago in a very personal, me-focused way, if you count Livejournal as blogging of sorts. It’s quite a nice record of my life for those years, but it isn’t a very interesting read for anyone else. I recently (3 months ago) started a proper blog – Adventures in Silverland. I’d just started a new hobby in silversmithing and making jewellery, and was swept up in the addictiveness of it all. I spent a lot of time browsing online for inspiration, tips, resources etc – and what I really wanted to find was a blog which showed me how someone else developed their skills and progressed, and the sorts of decisions they made as they went along. I couldn’t find one that really hit the mark for me. When I had a disappointing experience at a silversmithing course after not being able to find any reviews online, I decided to start my own blog to write about it and stop others’ from having the same experience. I thought I may as well try and fill that blog gap to do all the things I listed above and document my journey of discovery. It’s a very different writing experience from Livejournal though – I have only just started planning my posts and thinking more in terms of what an audience might find interesting. I still have a lot to learn but hopefully I’m building up interesting content that will be a useful resource in the future for similar people getting hooked onto the craft. I think I started blogging because I wanted a place to explore my photography and creative avenues. Oddly, I didn't start a blog to write as strange as that may sound. I'm a graduate student in literature so I write A LOT on a regular basis. (think 150 pages every 4 months). No, I wanted it to be a visual adventure, it gave me a reason to document things I normally wouldn't. It forced me to think about shooting differently (who knew shooting food was so dang hard?). It also gave me an excuse to make a lot of things without feeling guilty and cook new things I wouldn't otherwise because I fell into my routine of staple meals. Hi Danni! I hope all these stories are keeping you entertained! I always wanted a blog to share the crafts and recipes I work on as a young 20-something starting life on my own. I've made a few attempts at blogging over the last 5 years but I couldn't commit to posting as much as I wanted and would lose interest. Then I came up with the idea for my current blog (Young Broke and Marvelous) and something just felt different! I felt like I had a concept this time. I spent almost a year planning what I was going to do. I was endlessly looking at blogs and reading about blogging as well as designing my blog and coming up with post ideas. My blog has been up for a few months now and so far things are going well! It looks great and I've been getting good feedback. I can't wait to see where it takes me! I started my blog so that I could prattle on about my Etsy shop. It didn't go well. So after a couple of months, with no one listening, I started babbling on about my life as well. I made some random tutorials, I featured a few Etsy listings, and as time went by, focus on my shop disappeared altogether, and instead I ended up starting a weekly-installment of my blog-exclusive fantasy story, started documenting my hunt for a literary agent, and the weekly etsy features of other people remained. I'm happy with it, but mostly because it's really helping me get my head around and organise what I'm doing to find an agent and get my dream career off the ground. I started my blog to help recover from a loss. It's interesting because I never thought of it that way until reading this post... but that's exactly why I started blogging. I was scared, sad, and very confused so I started blogging as a way to figure things out. Ironically, I totally don't have it figured out at all and I still haven't fully 'recovered' from said loss. My blog is called Big White Farmhouse and is named in honor of my amazing great-grandmother, who passed away in Dec 2010 (at 99 years old!). She was a huge inspiration to our entire family with her dedication to family, learning, and making a house a home. With all of that in mind, I dove into the blog world and have been writing about my own experiences with those themes ever since. I've been blown away at the amazing way a blog allows you to connect with others! What a blessing. I started my first blog when I was graduating in 2007 as well. I had a lot of ideas for what I was going to be doing, and my boss at the university said I would need to start one, so she could keep up with my adventures. Then, in December 2010 I realized my FB was getting way too filled with my new sewing projects, and I wanted to have a new forum for sharing them. Thus Ninth Street Notions was born. And I've been loving it since. I started my blog, gogirlshoppe, to go along with my traveling shop on wheels. She is a 1976 Shasta camper that we renovated into a shop that travels all around North Carolina selling fun vintage and elclectic items. Our customers can follow us on facebook.com/ the go girl shoppe however we also like to use our blog to tell stories about our adventures. Our blog is a way we can connect with our customers that have seen us out at events. It is fun! What a nice subject that i found myself about thinking what i caught and missed and made me have a big smile. :) I started to write between watching Californication and playing Diablo 3. :)) Writing a blog was always in my plans but i didn't know when and what i'll start with. When my husband made me a very big suprise (he bought me Diablo 3- you know i'm a big fan since my childhood- he gave it to me for our engagement anniversary:) And that was the best present i had ever! So i started to play when he was not home and when he's at home we were watching Californication online, i didn't ever tought the agent Mulder is handsome So was it turns out that he is handsome and encouraged me to write. So i started to write and i liked it so much to not playing Diablo. I'm at 12. or 13. level i guess :) and not playing but i want to if i had some time for it. But writing is so much more exciting i guess.. I am a turkish girl who likes writing, watching, listening, reading, doing it myself, and much more cool and pretty things. Now i started to translate my blog to English and waiting for you.. :) Sincerely thanks for he subject that made me smile and inspire. Have a nice day! It started out all home projects with a few posts on my quirky corgi thrown in, now has other diy projects and a bit of fashion thrown in too! I love it even though I only post once a week ish! Started my blog out of absolute boredom... I was unemployed for a month, my boyfriend was busy with classes and working... instead of going crazy, I started blogging. Hhaaha. "instead of going crazy"... riiiiiiiight. I started out with a food blog called Shoestring Kitchen. I suffered from chronic back pain and the last thing I wanted to do after sitting at a desk job all day was sit some more. So cooking was my therapy. I was also on a budget, so I shared recipes that were cheap and delicious. Once I got back surgery and started feeling like myself again (I'm only 26! ), I wanted to make up for lost time. On New Year's Day, as I was burning my Christmas tree in a bonfire on the beach, I made a resolution to get into more trouble. Not the kind of trouble that gets you arrested or leaves you feeling hungover the next day. Just the kind of trouble to get me out of my comfort zone. So I started going on adventures every weekend. Adventuring isn't about how far you have to travel. It's about letting go of control and having a positive attitude no matter what... because more often than not, life doesn't go as planned. As of last week, I renamed by blog [url="http://www.shoestringadventures.com/"]Shoestring Adventures[/url] since it no longer made sense to have a food blog. I love the direction my blog and my life have taken me. The most rewarding feeling is when someone asks to join me on an adventure. If I can inspire just one person to try something different, every word I've written is worth it. I grew up with the internet, and was in college when Facebook launched; it was a time of Xanga too, so I guess you can say I've been journaling in the online world for awhile. I made a switch over the past few years when I turned 25, and realized that my quarter-century marked was vastly different than anyone else in my family and among my friends; I didn't know what I wanted to do with my life, if I was dating the right person, if I was fully living or just waiting for time to pass and "grow up." My blog started as a search to answer those questions we have at 25, and then grew into something so much more when I realized my change wasn't so unique after all. My blog has traveled with me to all the cities, breakups, career changes and vacations over the past three years, and has introduced me to a wonderful group of friends. My blog started totally because of you Danni, I saw the way people read and responded to your amazing blog and I thought, I want to be like that,known for that. So I've started up and Im currently on my 9th post, Its hard as i'm not sure what i should be blogging about and I have no readers but Im going to keep going, try and get a little bit of traffic through my blog before I start uni so that hopefully when I start uni and open my Etsy shop I'll have a few people's interest. If you have time have a quick look? I started my blog because I was spending so much of my free time wandering around internet forums giving people advice. And they seemed to like it, and really appreciate it! So I thought instead of giving my advice away and driving up pageviews for the forums, I'd go it alone! And I love it. I started Beautiful Hello Blog out of a bit of boredom and desperation (quite honestly!) My husband was stationed in the middle nowhere Texas and I, being an artist/designer/city girl was going a bit crazy! I needed a place to feel creative and to meet other creative people, so I began Beautiful Hello Blog! It has been a crazy exciting road from there. I have loved meeting new friends, getting valuable feedback, and challenging myself to be a better person everyday. My blog is mainly about art and design, and I can whole heatedly say that I have learned more about art, design, and business than I thought possible! Thank you for your blog Danni! It feels so fresh and genuine. We really do appreciate your hard work and dedication! You're touching many lives. hello there Danni. I hope this can entertain you for a bit. As a graphic design student in college I had always been a blog reader in college, but could never really find the time to start one myself. I also, at that time, didn't believe my life or creativity was strong enough to create a Blog. I graduated in May of 2011 and after college started on the path of trying to find a career and figure out this thing we call life to find myself in a hand full of jobs that had little to do with design. It was then I started on a path of wanting to create a blog to have a place to design, network and continue doing something I love so much and am so passionate about. In October I found myself in a position at a non-profit in charge of the website. Although I do get to design a little I found myself at a breaking point during this job that I had to start a blog and satisfy my need for creativity. So I started a Blog in April of 2012 and never looked back (ok i know its only been a couple months, but it was a long time coming). I really love blogging and when I code and fix facts on a website all day it's so nice to go home and design! It also is keeping the door open that one day I will jump into the world of design (sooner then later) and has given me great freelance opportunities to design for as well. Well thats my story and only the beginning as my blog and career are still building and I am really excited about that! Thanks for letting me share Danni! Have a beautiful day! Like you, I started a little old blog a few years back... and well, I've improved. Learned more about web design, and most significantly, photography! One day I realized that my blog had no direction. I was just posting for the sake of posting. Honestly, if I didn't write it, I probably wouldn't read it. This time my blog is focused on what I love: sewing. I have sewing e-courses, tutorials, and basic posts. Can't. Even. Wait. I'm so glad I realized that blogging is about passion, not numbers. That as wonderful as that blog may be, people and experiences are better. And that with some time management, it can be just a small and happy part of my life! Merci de partager ton histoire..
Je te suis avec plasir. What a fun topic! I started mine in 2008 on wordpress after being encouraged by my then fiance ;) He kept telling me you can do that when ever I would read my favorite and oh so new blogs. He showed me how to set up everything since I was so not interested in setting up templates, had no idea what to talk about or even if anyone would ever read it. At the beginning it started out mainly as an interior design only blog since I was still working in the industry but since then has morphed into things I love, all aspects of design and life. It more recently has taken a migration into a more "stay at home mom" type blog with crafts, recipes and pretty things...all of which I truly love. And now that I've got a little one brewing its starting to move toward the more kid friendly arena...again, as my life changes so does my blog. I try to stay true to me and I'm finding more and more people are responding to the honesty. Thanks for letting us all walk down memory lane Danni! I've been following blogs for years. I attempted to make a few blogs in 2007 and 2008 and they always failed, I wasn't ready for it. In 2010 I started video blogging and that became my calling. Around 2012 I really started with my own website and making blog posts and haven't turned back. It wasn't my time before but now I am so happy I'm into it now. When I opened a shop on a local version of Etsy to sell my (ugly) handmade accessories, in early 2010, I decided to make a blog to go with it. Me and a friend were considering writing one together, but in the end it was just me. My first posts were just pictures of products and the price, maybe a few words in my native tongue - it was more of a shop than a blog. It slowly, slowly developed into the blog it is today, more centered on my outfits than my products. I love hearing your blog story! I had a personal blog in college. Probably started it about 2004-5. Only my good friends and family read it. I loved practicing my writing, which I didn't get to do often as an engineering major! I had that blog until about 2007. I toyed with the idea of starting up a blog again for a while, but I couldn't really decide on a topic. I mish mashed a bunch of ideas in my head for a couple of years & finally dedicated a blog to my love of color in 2011! Daydream In Color was born. Yay! I started my blog, 619 miles, as a way for my friend and I to share our projects and inspiration. We were sending so many emails back and forth with ideas and photos and they kept getting lost in the mix of all the other emails. I created the blog and named it after the distance between our houses (KY & FL). Now we have a great place to share our projects, lives, inspiration and fun with each other and the rest of the internet. I was in an incredibly unfulfilling job, and my boyfriend at the time encouraged me to start writing. I had followed a kabillion blogs for years, but never felt that I had enough to say. I finally just jumped into it, and I've loved it ever since! About a year ago my friend, Mollie, and I started our blog Waking on the Wing to promote our freelance writing and editing business, and to just keep track of our post-college grad lives! Unfortunately Mollie moved away and we had to say goodbye to our freelancing dreams, but it inspired us to create our own blogs! Mollie know writes at Light By Morning and I write at For Love & For Laughter. It's fun to see where the two of us have gone. We've both gotten married and have gotten different jobs since the start of our first blog, and it's fun to keep up with each other through our posts (though, phone calls are still on the top of our list). For Love & For Laughter was pretty slow going at first. It was weird writing without Mollie's support. But, recently, I've found a new fire for the blog and I can't wait to make it my own! After years of reading blogs and talking to my boyfriend about them daily, he created a word-press account for me and told me: you know you want to, just make your own! A year and a half later I can't thank him enough. My blog has made me rediscovered my camera tricks and love for photography & editing. It has become my creative outlet and I love the all the people I've met along the way. I've been writing an online journal of some sort since 2002. First on Diaryland, then on Livejournal. I started Little Gray Pixel in 2008 to accompany my Etsy store. It was my first foray into public blogging, so a lot of things changed for me overnight. I didn't share a lot of my personal life in the beginning. But I really missed it, so shortly after the birth of my daughter I really reclaimed my space as mine. For posterity. For now. For fun. my blog first started as a place to share my random inspiration. sorta like a creative outlet (since i work in healthcare). i wasn't posting very often (once every few months...) but now that i got my friends into reading my blog and also into blogging, it's a lot more fun and i try to blog more consistently. I started my blog so I can participate in Illustration Friday but the more I got into reading blogs and being part of this great community, the more my blog grew - now its more a lifestyle blog and I love it!! Id like to get back to that small blog feel connecting to my readers more often! here is my blog if you want to have a look! I really love this post. I've been thinking about the same things lately, how every blog seems to be about strategy and growth right now and not about real passion. I know I've lost the giddy of blogging and I'm missing it. Your original blog cracks me up. I love it! I started my blog way back in 2005. Sean and I always make each other something for Valentine's Day so I decided to try and make him a secret blog where we could write notes to each other. When I signed up with Typepad my plan gave me the option for three different blogs so I also started my own. I could have never guessed what an integral, inspiring part of my life blogging would become. I started my blog just over 5 years ago, after my son was born, as a way of sharing my life with my family overseas (I was the one overseas!). It was very random and nobody much read it, until I started posting regularly on my Project Life pages, and other people started reading it. I got excited and saw what a blog could be. I am in the process of discovering what I want my blog to be. I hope you have a good trip! I started mine (A Swoop and a Dart, http://www.elizabethdillow.typepad.com) early in 2005, because my little sister pestered me to do it; she had already been writing her blog for some time, and really wanted me and my other sister to get started so we could keep in better touch long distance. It is by far one of my most treasured things all these years later. Emily!!! That's the name of my sweet friend that said, "Ana, you should blog." And so, iluvframes.com was born! I recently went back and read some old posts, and laughed at how awful my writing was! Hope I'm a little better now. My posts these days consist of mommy-ing, photography, art history, and the occasional DIY post. Thanks for sharing your blog story, Danni! Writing is such a humbling process, whether it's a tangible journal, or an online one. I always kept a journal growing up, so when I discovered I could write something and it could stay on the internet [and not hidden under my mattress] I was all about it. I started off on livejournal, did a brief stint on myspace, and then discovered blogger. I had a personal blog that I didn't advertise, but I got really into reading other peoples blogs and specifically food blogs. around the same time I started to explore my passion for photography. I would bake things and take pictures and post them on facebook, and my friends and husband urged me to start my own food blog. and I did start one [bakedwithloveandbutter.blogspot.com] and it became relatively popular. but I kept my personal life and feelings out of it. looking back, it was kindof like living a dual life. I kept it up for a few years but then two major life changes happened: I discovered I had a gluten sensitivity, and my husband and I decided to move to Taiwan. I knew that this was the perfect opportunity to have a fresh start, and to merge those parts of my life together and [hopefully] be brave enough to share them with everyone. my new blog, inkandadventure.blogspot.com , is about a lot of things. our adventures as Americans living abroad, traveling around Asia, trying new foods, practicing my love of photography. but mostly it is about me, trying to write in a way that is true to myself and who I am. I loved reading how and why everyone started blogging. Blogging is so therapeutic to me. I love that I will be able to look back on my life via my pages. So why I started blogging, easy! I started the very day I hopped on a plane from the US to S. Korea... I haven't been back yet so it's been quite the adventure over here. Blogging just makes it easier to share what's going on in my life with my family and friends still stateside. Great idea to start a blog discussion :) My day-to-day job sounds much like the conference you find yourself in, a 9am-6pm (or 8pm...or 9pm...) job mainly in an office. As much as I love it, my work represents only half of what I love in life. I also found I needed a channel to talk about positive, light-hearted things to get my mind off the day-to-day work pressures. And thirdly, as an expat, the blog helped connect me to all the friends and family I still have back in the States. Blogging has become the best of all worlds for me and I've even found a new passion for photography. Thanks to inspiring bloggers like you, those of us who are newer to the craft have much to find encouraging! I started blogging back at journalism school as part of the course and I chose to blog about fashion vs the economy because we had to blog about something "serious"/ an issue of some sort. I discovered Google Reader from that and a whole new internet world opened up. I loved blogging because I found that journalism was quite strict and blogging my opinions mixed with news had a real feeling of freedom attached to it. So after the course I ditched the fashion blog and started You May Say I'm a Dreamer which has gone from an inspiration blog, to photography, to books, and finally, to a whole lot of things that inspire me. I share bits of my personal life, things that I love, where I live, as well as my love of books, photography and mainly writing. And I do it all with just one rule: no negativity. I just want to share happy things with people to encourage the world to live the life they want to live and to be happy. Funny how you have this post about starting blogs. I finally found some time to start up my blog: myheartbelongsto.wordpress.com I met you last year around the same time at your wonderlust sale I think it was in Fullerton? I shared my craft and design album with you. I was with my cousin and they totally blew up my spot about how I'm such a huge fan of yours. Embarrassing but it was such a pleasure to met the person behind the blog. I felt like I knew so much about you before even actually getting to meet you. Sounds kind of stokerish... Anyway I don't know if you remembered but you encourage me along with my other friends to start up my own blog. I think it's a great way to express myself outside from work. Just find it a bit challenging to find enough time to create new post. You make it seem effortless. Btw Congrats on your new place! I started my blog - simplebundlesofjoy - when I gave birth to my baby boy. For some Chinese superstition, my parents couldn't visit and see him because my grandma just passed away. So, this was my avenue of sharing my baby boy's daily highlights. It just became a personal blog from there with me writing not just about my baby boy now but also about the scenes in Manila and the places I've traveled to. I started The Key of Kels after moving from the east coast to the west. I wanted a way to show my friends and family how much I was learning and seeing in this new setting. After a few months, I started getting comments from people I hadn't talked to since grade school who loved hearing my stories and following my adventures. It made me realize how lucky I am to be living in this crazy life of mine and to be doing all these wild things so far from home. I am so grateful that I have found a wonderful creative outlet that I will be able to look back on for years to come and relive every wild Los Angeles day! I love that you started because of a friend saying you should. Mine own was started for similar reasons.